When a friend suggested Spreads for a breakfast meeting, I didn’t hesitate. Spreads has amazing lunch options, so I figured the breakfast would be pretty good too. 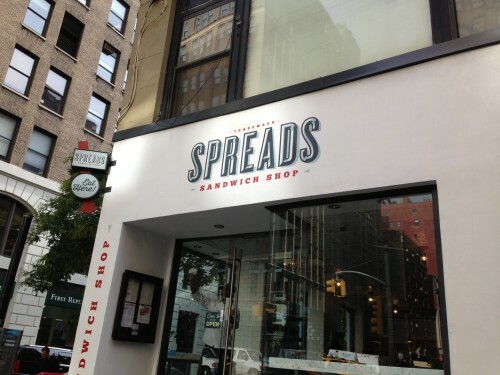 Related-note: Spreads has randomly come up in conversation multiple times recently, and I have yet to talk to someone who doesn’t love it. Anyone out there had a bad experience? Since this was a meeting with a friend, it was clear almost immediately that we were going to share two items. (If only this was socially acceptable in all situations.) My friend had been for breakfast a few times, so I let him take the lead on ordering. We arrived just as they were opening, and I don’t think they were fully ready for service. While we waited a while for our food, we got to catch up and try the free samples of vegan donuts, which were surprisingly awesome. 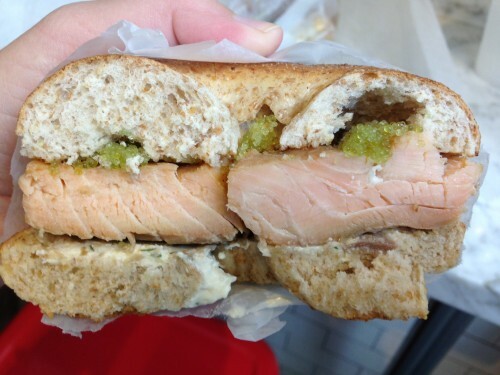 First, he ordered the salmon bagel ($7.75), which came with applewood hot smoked salmon, wasabi tobiko, horseradish dill cream cheese and a whole wheat scooped-out bagel. I won’t say it this sandwich was as good as the Super Heebster from Russ and Daughters, because it isn’t. But it still very good. 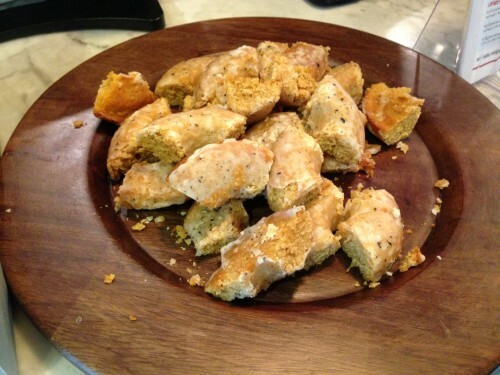 I loved the idea that they scooped out the bagel, even if it wasn’t well executed. I think the scooped out bagel gets a bad wrap rap (see grammar lesson below). Think about it: it can make a bagel sandwich sooo much more enjoyable without the filings sliding out of every side. He also ordered the egg and cheese ($5.50), which is a deceptively simple name for a not-basic sandwich. This version comes with more than the name suggests. 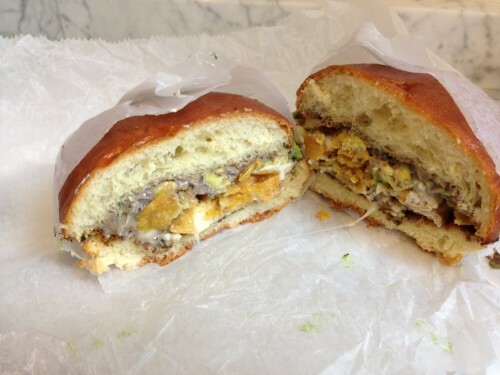 It has over-easy eggs, Monterrey jack cheese, avocado, black bean, chipotle hummus and tortilla chips on a brioche bun. This was pretty much my perfect egg sandwich. I regularly make egg-based breakfast (at least on the weekends) that includes some of these flavors, but it is hard to beat an amazing egg sandwich like this for only $5.50. So while Spreads stops serving breakfast from 12pm-2pm, you can still order breakfast all of the other hours they are open. That means for 9 hours a day you can have these delicious items. 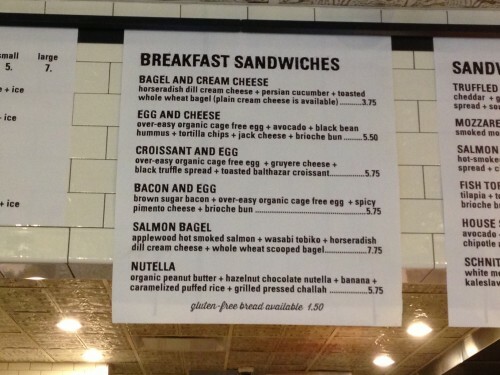 I think the bigger issue here is why did I not also insist on trying the peanut butter, nutella, banana, caramelized puffed rice on grilled pressed challah. I am salivating just typing that. I have found the perfect Mexican inspired egg sandwich. The menu and each dish is streamlined and on point. It is a shame they say the bagel is scooped out, but they didn’t properly scoop. On my way to work, I need breakfast to be prepared fast. I would rather be 30 minutes late for work and stop at Russ and Daughters on the way. Posted by Sarah Zilinski at 9:00 am, November 8th, 2013 under Flatiron Lunch. I tried this spot for lunch once when it was new, and I was underwhelmed by the salad I got and the price, which for once kept me from ordering an add-on of any kind (I think I wanted dessert and demurred at paying $15+ for dessert and salad that day). So, I have a co-worker in a gluten-free phase who loves it, and I’d say I owe it another chance, but maybe for that salmon bagel on a day I actually do bring my lunch.